Roy Herburger has played an integral role in Elk Grove’s political landscape for fifty-six years. Born in Cambridge, Nebraska and raised in Stratton, Colorado, Roy inherited an interest in the newspaper business by working with his mom and dad – owners of the Stratton Press. A graduate from the University of Missouri with a bachelor’s degree in Journalism, Roy’s reporting career was put on hold to serve as a navigator, First Lieutenant in the United States Air Force during the late Korean era. In March 1959, he purchased the Elk Grove Citizen and Galt Herald and settled in the south county area. A resident of Elk Grove for over 58 years, Roy has four children, Elizabeth, David, Leah and Vanessa. As Owner, President and Publisher of Herburger Publications, Inc., Roy has reported the comings and goings in the Elk Grove area for five decades – at times being as much a part of the news as being the news reporter. His commitment to many community issues including education, incorporation, and the environment have earned him the respect and recognition of local, regional, and statewide organizations including a park and school named in his honor. His awards are too many to list here, but they are numerous including the California State Fair Star from the Future Farmers of America, and Citizen of the Year for both the cities of Galt and Elk Grove. His commitment to local business is well known. He is a former President of the Elk Grove Chamber of Commerce and the founder of the local Think, Shop, Live Elk Grove campaign. 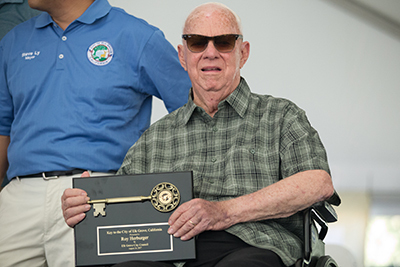 Roy remains closely connected with the Elk Grove Chamber of Commerce and he was nominated for this honor by its Executive Director, Angela Perry. Please join me in extending a most sincere congratulations to our friend, Roy Herburger.